Alfred's Rock Ed. : Led Zeppelin Drums teaches you the drum parts to three Led Zeppelin songs, and directly corresponds to the guitar, bass, and keyboard books in this series. 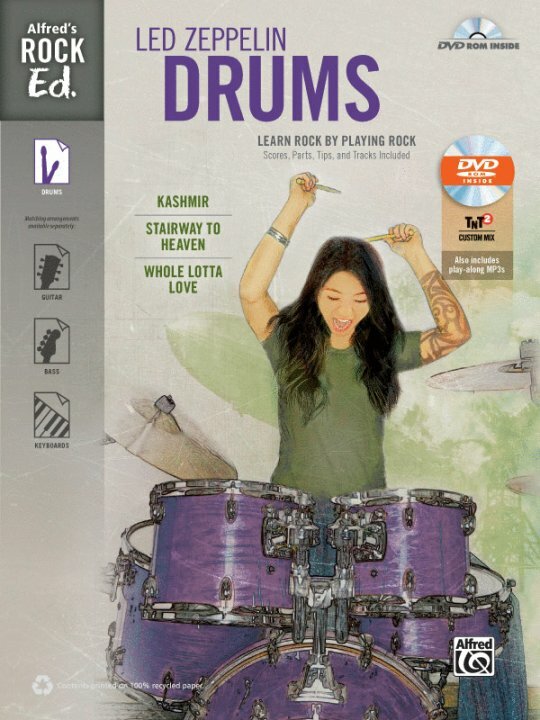 Crafted from the standpoint of group rather than individual instruction, this series will teach beginning and intermediate musicians to perform together in a rock band, not alone in a bedroom. Included are the drum parts; in-depth lessons for each song; a DVD-ROM with sound-alike and minus-drum MP3s for practice, as well as instructional MP3s that correspond with the song lessons; and our exclusive TNT 2 Custom Mix software that lets you alter the instrument and vocal mix, slow tracks down, loop sections for practice, and even change keys (perfect for vocal practice)! And as a bonus, the disc also contains full score and vocal part PDFs. Titles: Kashmir * Stairway to Heaven * Whole Lotta Love.